I showed you my latest project yesterday that was so not planned. I think in my older age I am craving lighter and brighter and less clutter. Not to the extreme, but just less than in the past. It seems like it was last year when we painted the great room, foyer and all the attached walls in the open space in Manchester Tan which is so nice and bright compared to the before, but I looked it up and it was actually in 2013. I was very surprised it had been that long. Time sure flies by. Last November I painted the built ins and mantel the same color as the walls for a fresher monochromatic look. This added more light to the room as did removing the dark woven shades that were on the windows. I took those down months ago. Now the light pours in even more. I have several light and bright rooms pinned like this one by Ballard Designs. I don't want to go completely white. I just want a neutral back ground and then I can add pops of color with accessories without being tied down to certain colors. 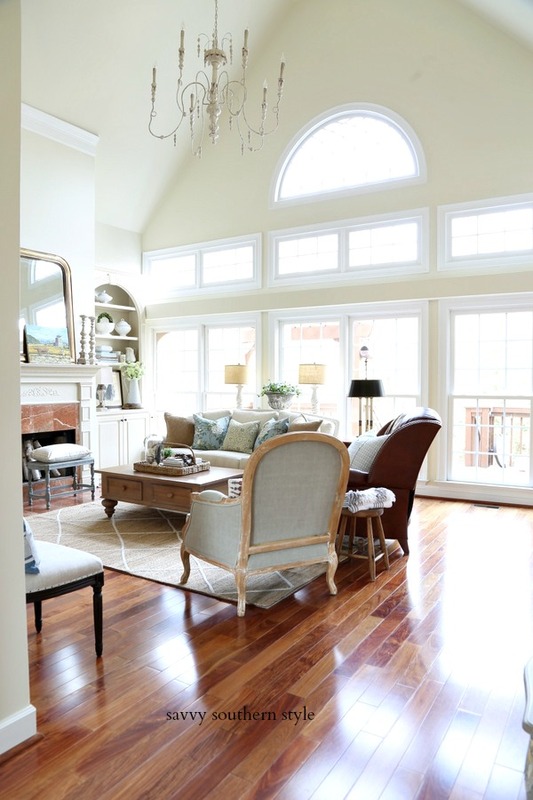 This is another fab room by Ballard Designs done in the color of the year, Simply White. I know a lot of you love the red checked drapes, but I took those down a couple weeks ago. Those make me stuck with just certain colors. Soon the only room with a lot of red in it will be the farmhouse style guest room since I'm weeding it out everywhere else. I can bring it back with pillows and things when I feel the urge for red. Another paint project that I am dreading, but I really want done is painting the yellow ceiling in the dining room. When I painted the walls white years ago I just couldn't bring myself to tackle the ceiling, but now I am just going to have to bite the bullet and do it. So over the last few years I have slowly been lightening up the rooms. I painted the two guest rooms. One a few years ago and the other one last year. The kitchen got lightened up with a less yellow white, too last year. The only room that is still rather dark is the master, but for now I like it that way especially after doing some updates in there which I will share soon. I hope y'all will come back tonight and share any updates or plans you may have in your home or any other diy, crafts, recipes, etc. at 7pmEST. Have a great day and see y'all then! I love your plans, and know what you mean about the lighter and brighter! I was staring at our bedroom this morning debating paint colors and taking a brush to some of our furniture. Imagine that. Look forward to seeing what you do! You are talking right up my alley! I love light and bright (let the sun shine in! LOL) in our home. Many don't agree, but almost all our home is painted the same color, a warmish white. Kitchen and a guest bath are a shade or two darker. My upholstered pieces in the great room are a bit darker than off-white but they are a textured fabric and have done great. Bedcovers in master and guest are cream matellase (sp)with duvets/quilts, etc. in colors added. Shams and dust ruffles can also bring in color/texture. 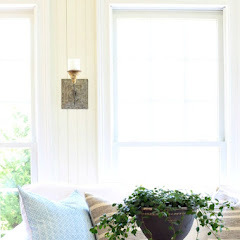 Sunroom (also used as den) has off-white slipped furniture. When I finally became true to using colors I love (aquas/robins egg blue/turquoise family) as accents, I really came to love our house more. That second room you show would fit right in my house! Looking forward to seeing what you do. Kim! I love the yellow ceiling in the dining room, but can't wait to see what color you come up with to replace it! I tried to comment last week on your lovely "let's talk" post, but I kept getting blocked. But, you have a sensational blog filled with inspiration. As for the ads they have been a fact of life for the better part of a century. So I think it's safe to say they are here to stay. Mostly I tune them ou, but every once in awhile something new grabs my attention, and I'm thrilled to have it on my radar screen! It would be silly of us readers to think you shouldn't make any money from the amazing style talent you have. If you didn't it would be lakin to asking a professional athlete to play only for the love of the game. love those Ballard rooms. 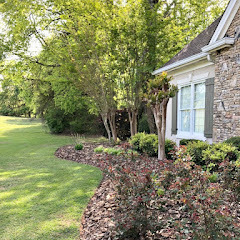 I have been lightening up around my home and it makes changing things around sooo much easier! Lightened up my kitchen by getting rid of the red walls I had had for so long. I loved them but they made it feel so small! Feels like a new room now! Can't wait to see your new lighter sunroom! Sounds like some great plans. I love the lighter colors and those Ballard photos. 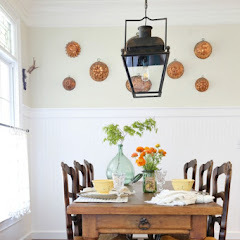 I have been thinking about lighter colors for when I finally paint my dining room this year. I can't wait to see your finished sun room! Kim I think we all go through changes and our styles change from time to time. I too am over the red right now and into earth tones. Sometimes it's just time for a change. You light and bright concept is looking great Kim! Great plans, Kim! I will be watching for you to post those as you finish! Happy Tuesday! 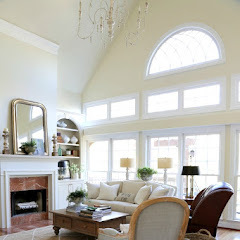 Love all these ideas and I know since you are the painting queen you will tackle those ceilings in no time. I love that Simply White color hoping to paint with that color in my new home eventually. It's amazing how paint can change the entire ambiance of a room. Even though I like a hint a color in my wall colors, I've always stuck with colors that act as neutrals when it comes to adding other color accents. Whites definitely provide lots of options to easily change out the room decor. 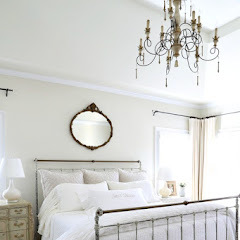 White ceilings are a must for light and bright rooms...just my opinion. Can't wait to see your completed sunroom. I'm craving lighter, brighter and less clutter too but I don't like all white rooms. Lighter walls really make everything stand out. I painted my livijng room Linen Sand a couple years ago and now feel it has too many yellow undertones. It's hard to pick out the perfect shade of white. I do have lighter furniture now so it makes the room brighter. You are a master at painting but ceilings are difficult to do. I love everything you do with your home. You do it all just right! I wish I could afford Ballards things because they sure have beautiful stuff! I like your lighter and brighter ploans. Mine are the opposite, Color is my thing:) But I will be doing the hall, master bedroom, bath and sitting area all in a neutral so I can add color with accessories too. Have a beautiful day!!! I love neutrals so much...you really aren't limited to any color scheme, and can change it quickly! Love your inspiration rooms. Lighter is better, but I agree...bright white isn't the way to go always. Like the brighter look! I loved your red checked curtains though! Oooh...I love the look of that Ballard Designs room with the grey cabinet and round coffee table against the creamy tone of the Simply White paint and the striped couch. I'm all for lightening things up and couldn't agree more about a basic neutral palette as the foundation and accenting with brighter colors that can easily be changed, whether seasonally or whenever strikes you. It's the way to go. Can't wait to see the results of your sun room update, too. We had Manchester Tan in the living room of our previous house and loved it. I'm one of the ones who loved your red and white curtains. I wish we lived closer, or I'd consider buying them from you. I'm going to be doing our lower guest bedroom in red and white, and I have a large cow canvas print that will be hung above the bed. The print actually has two cows and it had hung in the kitchen of our previous house. Our lower level bathroom is also red and white. Right now, red is not looking great to use on our main floor. I love watching you repaint and decorate. I have a ceiling to tackle this year as well, and dread working on it, but mine is only in a small bathroom and as part of a complete repainting job. Like you, I love light and bright as well, but my challenge is balancing my love and desire for clean, light and bright with our warm, cozy natural wood walls and (in the great room) ceilings. Going more neutral does open things up for rotating accent colors. Your putting out your reds while I'm putting mine in! LOL! 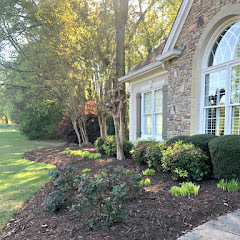 our styles and tastes do change over the years, mine probably quicker than others, and too soon at times too, but in the end, for people like you who certainly has excellent taste, it works out in the end, because no matter what style or color scheme you choose Kim, your home will just be beautiful! Styles change from time to time and so will light and bright. I like to stick to the classics, but change is great! Kim do you ever sell anything you are no longer using? Normally I take my stuff to a consignment shop and stuff not good enough goes to GoodWill. I have never sold and shipped before. I probably should start some time. It's just easier to deal locally. You are pretty close to my sister. I have considered a booth in the past, but so many have given up their booths because they aren't making anything and it's so much work. I have lots to unload now, but then I would have to find new stuff to sale to keep it up. Not starting that now. Thanks for answering my post! The ceiling is a huge job, but you'll be happy one it's done. I love your yellow ceiling, but I love color! We painted our living room/dining room/entrance real turquoise and we love it. The hall is a deep red. After having it all yellow it is quite a change. I don't care for the neutral colors but that's what makes the paint stores stay in business!! !